If your dog seems to be itching and scratching with no relief, there is every chance that they are suffering from a flea infestation. And when you notice this problem, you will want to treat it as soon as possible. Otherwise, it can lead to your home getting covered in the little blood-suckers and wider health issues for your pup. Of course, there is a variety of different treatment options out there, but one of the simplest and most effective is a flea collar. However, with so many similar products out there, you may be wondering how you set about differentiating them. Well, this blog post is here to give you a helping hand with our rundown of the best flea collars for dogs currently available. 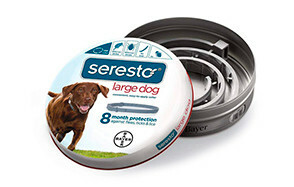 Created by Seresto and recommended by vets, this flea collar for large dogs provides eight months of continuous protection from blood-sucking ticks and fleas. It offers a continuous release of medication at a slow speed, which saves you the hassle of giving your dog more regular treatments. This 8 month flea collar has several advantages over other treatments including being mess-free, odorless, and non-greasy. Since it kills ticks and fleas upon contact, the fleas don’t have to bite your pup for it to work. It is easy to put on your dog and is compatible with leash collars as well. Made for both dogs and puppies alike, this natural flea and tick collar uses active herbal ingredients and essential oils, which is unlike other collars which rely on chemical pesticides. Since the oils are used in aromatherapy, the scent promotes relaxation, but you may want to leave the collar outside for a day or two if you or your pooch find it too overwhelming. The slow-release design of the collar keeps it functioning for more than five months. If your dog wants to go for a dip, you don’t have to worry about removing the collar as it is entirely waterproof. 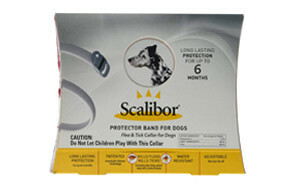 A highly-rated product, this flea and tick prevention collar offers continuous protection for six months. Designed for medium or large pets, it gets to work killing the parasites already on your dog within 24-48 hours. Tested by vets, it is non-toxic and will not harm your dog. But it continues to release the medicine which both kills and repels fleas, ticks, and mosquitos. As well as being waterproof, the flea collar is also odorless, so you and your dog will hardly notice he is wearing it! 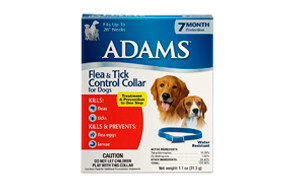 Don’t be fooled by the fresh scent of this flea and tick collar; it will kill and repel fleas, ticks, eggs, and larvae. And it also has the convenience factor of being wearable with your dog’s regular collar as well. Made for puppies at least 12 weeks old and adult dogs, it will fit neck-sizes of up to 22 inches, so get the tape measure out before purchase. It is designed to be water-resistant, so you don’t have to worry about taking it off if starts pouring outside. A one-size-fits-all product which is suitable for dogs older than 12 weeks of age, this flea and tick collar offers long-lasting protection of up to six months. As well as defending your dog from future infestations, it also kills ticks and fleas. This fully adjustable collar is also water resistant, so you don’t have to worry too much if your furry friend wants to go for an occasional swim. Since it is odorless, you will hardly even notice your dog is wearing it. Designed to detach and kill ticks for a period of three months, this collar is recommended by veterinarians. It is fast-acting and gets to work within a period of 24 hours. Bear in mind that while the collar is adjustable, it is designed for dogs weighing over 60 lbs. Give your dog protection against ticks, fleas lasts, eggs, and larvae for seven months from the moment you put this collar on your four-legged friend. As well as prevention, it also kills fleas and ticks which have already attached themselves to your dog. The adjustable design means that it is suitable for all sorts of canines. You can rest assured that it will continue working even when it gets wet. A herbal repellent which is effective for up to four months, it works to repel ticks, fleas, and mosquitos. The active ingredients continue to slowly diffuse over time, and its waterproof design ensures that it continues to work well, even if it happens to get wet. Suitable for puppies, adult dogs, and cats, it uses a special blend of oils rather than the harsh chemicals which are used in other similar products. Not all dog flea collars were created equal. There are plenty of individual features which could impact your decision-making process. After all, you want to choose the one which is going to be most effective for your furry friend. So, here are some things to consider before you make a purchase. You can either select dog flea collars which are infused with chemical or natural oils. Many people consider the chemical collars to be more effective, but they also have more side effects, so it really is a judgement call. Your decision may also be influenced by how bad the outbreak of parasites has become. If it is serious, a chemical collar may be the better option, but a natural collar is good for general containment and prevention. While some flea collars will only protect against future flea outbreaks, others will kill the ones currently on your pet. We all know that dogs love to splash around in the water whenever they get half a chance, and this is going to pose a problem if you have to remove the flea collar every single time they want to go for a dip. Some collars are water resistant, meaning that they can withstand soakings from time to time. Others are entirely waterproof. If you live in a particularly wet climate or your dog loves to go swimming, you are better off going for the latter variety. Dogs come in all sizes, and so too do flea collars. There is no point buying a collar which is not the right size for your four-legged friend, so it is worth getting out the tape measure before making your decision. It is also worth checking the adjustability of your chosen flea collar. You may need to alter the size of the collar based on any weight changes or perhaps your dog becomes shaggier and hairier during the winter months. Obviously, it is important to know exactly how long your dog’s flea collar is going to remain effective for. Generally, flea collars continue working for a period of three months or longer. Many of the ones which we have discussed above last for at least five months. The longer the protection period, the less often that you will have to worry about changing your dog’s collar, which certainly makes your life just a little bit easier! Bear in mind that there are hundreds of flea and tick species worldwide. You should do a bit of research to work out which ones are common to your area and more likely to impact your dog. Alternatively, you could get in touch with your vet to find out more. Look for the collars which promise to deal with a wide variety of parasites. The other thing that you need to know is that some flea collars will only tackle adult fleas, while others sterilize eggs and young fleas, which breaks up their lifecycle. A few collars will also protect against other pests including ticks and mosquitos. Ultimately, it is worth knowing more about exactly what level of protection the collar is going to provide before making your mind up. How old your dog is can have an impact on whether or not you should put a flea collar on them. Pups younger than 12 weeks old do not have fully developed immune systems and livers, and the toxins may be more harmful to them than adult dogs. Similarly, if you have an older dog, their immune system may also not be as well-equipped to handle chemical flea collars. You may also want to avoid using this kind of treatment on pregnant or nursing dogs. If you are feeling unsure, you should consult with your vet for guidance and reassurance on the issue. Modern dog flea collars contain flea and tick repellent chemicals which are released onto your pooch slowly over time. These chemicals spread throughout your dog’s hair, coat, and skin, killing the parasites which are currently on your dog and offering continuous protection. Newer dog collars have proven to be more effective than older ones which emitted toxins as a gas and could only kill fleas close to the collar. If you have only experienced using the old ones and have found them to be not particularly effective, there is every chance that the newer ones could surprise you. Dog flea collars have become a popular tool in the fight against fleas. There are several reasons why this is the case. Here are just a few factors which have made them so well-liked. First, dog flea collars are highly convenient. All you have to do is pop one around your dog’s neck for it to get to work. Many dog owners have testified that while they are simple, they are also effective in both treatment and prevention. And since they last for a period of months, you don’t have to worry about replacing them too often. You also don’t have to concern yourself about the mess and odor which are inherently involved in other tick and flea treatments. There is also the issue of your pup trying to wriggle free when you are bathing them or applying the solution to their skin. Since dogs are used to wearing collars anyway, they tend not to cause them any irritation, and they can often be worn with other leash collars. Many are also water resistant, so you don’t have to worry about continually taking them off and putting them back on again every time your pup is going to get wet. As well as being easy to apply, many flea collars will get to work within a period of a few hours. Once you have put it on your dog, there is nothing else you need to do except leave it to work. There is no waiting or drying period, unlike other types of flea treatment for dogs. Of course, there are some collars which we have discussed above that only get to work within 24 to 48 hours, so you should bear this in mind if you think something more instant if the better option. Dog flea collars also have the advantage of being an affordable way of ridding your dog of fleas and offering them long-term protection. You only have to buy a new one every few months to continue offering your pup the defence against parasites that they need. Some of the other best flea treatment for dogs can be prohibitively expensive, so if you are looking to rid and protect your pooch from blood-suckers, they could prove to be the ideal solution. While some tick and flea treatments require you to get a prescription before you put them on your dog, you can just buy these collars over the counter. Most dogs don’t have an adverse reaction to this treatment, but we will talk a little bit more about possible side effects a little bit later on. If you don’t deal with fleas early, there are other health risks beyond the obvious irritation which they cause to your furry friend. The most common is flea bite dermatitis which is an allergy to flea saliva. This leads to intense itching and scratching. If you leave it for too long, this skin can break open, forming scabs which can become infected. The back and base of the tail are the most common areas where this can be a problem. Another common issue that can arise as a result of fleas is that they can develop tapeworms. While both issues are treatable by vets, you are still better off dealing with the root cause of the fleas themselves. A more serious issue which can appear as a result of a severe flea infestation is anaemia, which can lead to medical emergencies and can even be fatal. Don’t forget that fleas can also bite humans and conditions like plague and cat scratch fever are transferrable from these parasites to pet owners. Now that we have outlined some of the advantages of collars as a method of flea treatment, we should look closer at their effectiveness. There are several factors which impact this. Natural flea and tick collars have the advantage of being gentler on your dog’s coat and skin, but they generally don’t have the effectiveness of those which use stronger chemicals. Natural collars tend to work just fine when it comes to prevention, but they are generally not as effective if your doggy has a current flea outbreak that you need to do something about. As a rule of thumb, the longer the flea collar has been on your dog, the less effective it is going to be. Generally, the quantity of chemicals that they release is going to lessen over time, so if your dog starts to scratch again or you think that they need some enhanced protection, you may want to switch the collar sooner. Check the manufacturer’s schedule for more information on how long you should leave the collar on your dog and how often you should replace it. While a dog flea collar is a simple product to use, there are still best and worse practices which will impact how effective it is. You should always follow the manufacturer’s instructions when you come to apply them. Firstly, the collar needs to fit properly around your dog’s neck, so measure them before purchasing one. If there is any leftover length, you should remove this as this will discourage chewing and biting. Bear in mind that some of the chemicals used in these products are not safe for ingestion. If your pet is still growing, you will need to check the collar’s fit on a regular basis. Even if your dog is already fully grown, there is every chance that their weight could change over time. If you get a collar which is waterproof, bathing your dog and letting them go out in the rain shouldn’t present too much of a complication. However, if you have only selected a water-resistant model, this could pose a problem as it could work less effectively after regular soakings. Depending on whether your dog is suffering from a mild or severe tick infestation, this can also impact how effectively the collar is going to work. If your dog already has fleas all over their body, it is unlikely that a collar on its own is going to kill all of them. You will need to use other anti-flea treatments as well such as shampoo. However, if your dog is suffering from a mild outbreak or you are just trying to prevent them from getting more fleas in the future, a collar often works well. As we have discussed, flea collars contain pesticides which are designed to kill and repel parasites. However, they can prove to be too harsh for some dogs. Even those which only use natural ingredients can prove to be problematic to some pooches. The majority of active ingredients are non-toxic, but some have been known to cause skin irritation or some form of allergic reaction. If you are feeling wary or unsure, it is worth consulting with your dog’s veterinarian for more information. As the active ingredients are often spread through natural oils, this can lead to them inadvertently being spread around your house via rugs, furniture, and clothing. For most people, this is not an issue, but these could trigger a negative reaction amongst others including skin redness, itching, and even flaring up asthma. If you find that the chemical flea collars are causing an issue, you could always consider going for the natural ones instead as these ones may not be as problematic. Having said all of this, the risks involved in using flea collars on your dog are generally small, and many pet owners decide that the benefits outweigh the risks. Fleas and ticks are pretty persistent parasites, and some sort of chemicals usually need to be used to clear the parasites from your itching hound. Whatever type of treatment you select to use on your dog, you should always monitor them closely to watch out from any side effects which they may be suffering from. Discontinue the treatment if you notice any problems which need to be addressed. Q: How does a flea collar work? A: There are two fundamental ways in which most flea collars work. Some offer one benefit, while others will provide both. The fundamental function of all dog flea collars is that they act as a repellent. Most modern collars contain natural or chemical substances which are steadily released over a period of months. Their design ensures that these substances are distributed evenly throughout your dog through the natural oils in their skin, hair, and coat. Protection is both continuous and widespread. The other function which some flea collars have is to kill fleas which are currently on your dog. Some release active ingredients which require the fleas to bite your dog in order to consume the pesticide and die. Others release the substance throughout your dog’s natural oils, which means that the pests don’t need to bite your dog before they are killed. Q: Are flea collars safe to use on my dog? A: In general, flea collars are completely safe for your dog. However, there are some dogs who have a bad reaction. It is unlikely that you are going to know how your dog will react until you give it a try unless you already know about their existing allergies. Choose a collar from a highly-rated brand which has good recommendations and you will maximise the chances of everything being fine. From the moment you put the collar on your dog, you should observe them closely to see how they react. If everything seems fine, continue as normal. But if they start to exhibit some strange symptoms, take it off straight away. Q: How long does a dog flea collar last? A: The length of time that each dog flea collar continues working depends on the individual product. Most last for a minimum of three months, but some are functional for as long as eight months. Five months is a decent average. Make sure that you take this into account before purchasing a dog flea collar. Q: Can I put a flea collar on a dog after using Frontline? A: You should avoid using your dog’s flea collar with other treatment unless you have been advised to do so or you are under the supervision of an expert. It is worth considering which type of anti-flea treatment you choose beforehand. Q: How long does it take for flea collars to start working? A: Again, this is another factor which depending on which brand of collar you choose. Many get to work within a few hours, while others won’t be effective until your dog has been wearing it for 24-48 hours. Of course, this doesn’t mean that your dog will get instant relief from the blood-sucking parasites on their skin if you have chosen a collar which is designed to kill them. It will take time for all the fleas to die, and you also need to bear in mind that some collars won’t kill the juvenile fleas and eggs. Q: Can I use a dog flea collar on puppies? A: Puppies who are younger than 12 weeks old don’t have a developed immune system, which means that they may not be able to fight the toxins in some flea collars in the same way that adults can. Also, their liver may not have reached the full level of functionality, meaning that it is not dealing with toxins in the way that an adult liver would. Another concern is that they may slip out of their collar easier and try to chew it up, which could prove to be dangerous as the ingredients inside are not meant to be ingested. Many flea collars direct that they cannot be used on young puppies, so always pay attention to these warnings. Q: Can I leave my dog's flea collar on when swimming? A: If the flea collar is marked ‘water resistant’, your dog should be fine to take the occasional swim while wearing it. However, some collars will stop being so effective when they are exposed to water for longer. If your dog wears their collar all the time, you should avoid bathing them more often than once a month. Your other main option is to choose a waterproof collar which they can wear all the time. However, if you want to be especially safe, you could remove their collar when you know that your dog is going to get wet. Our number one pick is this Seresto flea collar, which offers an unbeatable eight months of continuous protection from ticks and fleas. The collar has numerous advantages over other similar treatments including being easy-to-apply and compatible with leash collars. The odorless Seresto collar continues to release the medicine at a low concentration over time. There is no mess involved and it is also non-greasy. It also kills and repels fleas and ticks through contact alone, meaning that you don’t have to wait for your furry friend to get bitten. All these reasons put this product right at the top of our list of recommendations of best flea and tick collars.